Faces of contemporary music in music education – Editio Musica Budapest Zeneműkiadó Kft. Sign up to our e-mail newsletter and receive up-to-date information about new product releases and special offers. One of the gems of Editio Musica Budapest (EMB) is its increasingly expanding series of piano pieces by György Kurtág entitled Games. Now the EMB catalogue is being enriched with two new related publications: János Bali’s exciting and inspiring work, Introduction to the Avant-garde for Recorder Players, and György Orbán’s two-volume, completely individual Aulos: Piano Pieces for Advanced Players to Practise Polyphony. Beyond their basic differences (range, instruments, and target audience), the three works share common features, for example, an intensive connection with the music of the past and the stress on improvised elements, but most of all, going far beyond any educational aim, they enrich the repertoire of contemporary music with significant, exciting, unmistakeably unique-sounding compositions. Furthermore, they continue a valuable Hungarian tradition, namely: composers of instrumental tutorials commissioning prominent composers to enrich their works with new concert pieces. For example, Sándor Reschofszky approached Béla Bartók to be the co-composer of his Piano Method (1913). The traditionally strong connection between music composition and music education can of course be realised in other forms, as exemplified by the choral works for children of Kodály and Bartók, those par excellence artistic manifestations which became part of the music teaching curriculum of Hungarian children and at the same time entered the international concert repertoire. 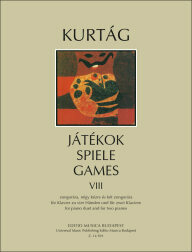 Kurtág’s Games series bears striking similarities with Bartók’s Mikrokosmos. Both familiarise the pupils or the musicians playing the pieces with the music and with the basic experiences and movements connected with the arts; and at the very beginning both take the child music student by the hand, but after numerous volumes reach valuable and even brilliant concert pieces. In the case of Games, these two faces of the series outwardly and fittingly separate from each other; the first four volumes, completed in 1979—in the creation of which a legendary piano teacher, Mariann Teöke, participated—primarily serves a directly educational aim. Over the course of the years further volumes have been published in succession (four up to today) representing an even more personal Kurtág genre, as indicated by the sub-title Diary Entries, Personal Messages. Just as the first volumes contained concert pieces of full poetic value, which have even become popular in recent decades, so the second series of Games is not devoid of technically quite simple, brief compositions, thus making it possible that through them those who are not professional pianists can enter the shrine of distinguished art. The second four volumes are simultaneously a personal portrait gallery of Kurtág. You can hardly find in them a work which is not a homage to his models, a deceased or still living composer, friend or colleague, or which is not dedicated to such. “Homage” is the key word of these four volumes. Great artists (not only musicians but also, for example, poets and artists) and figures quite unknown to the public appear with either their full names or initials, underlining that ability of György Kurtág to find in everyone that personal characteristic and unrepeatable quality which gives rise to a unique and indispensable element of the universe. Connected with his well-known passion is that he has always worked with and ardently involved himself with amateurs and musicians whose talent is not so outstanding. The eight volumes of Games now before us show a striking symmetry and closed format in that both parts end with a volume for four hands and two pianos (Volumes 4 and 8), though such pieces also appear sporadically in the other volumes. Meanwhile, Volumes 9 and 10 of the series are already in preparation. However, the greatness of the series is embedded not only in the structure or the proportions, but also in the inner richness of the pieces, which in the case of the first part of the series is primarily manifested in the elucidation of the piano’s traditional and novel possibilities of resonance, while in the second part it lies in the limitless diversity of artistic expression, sensitivity, passion, movement, and content which cannot be expressed in words—precisely as in the case of Bartók’s Mikrokosmos. Although the concept of Introduction to the Avant-garde belongs to János Bali, the work is emphatically a collective creation, since a significant proportion of the pieces are by other composers: Ádám Kondor, Gábor Kósa, György Kurtág Jr., Csaba Laurán, Dóra Pétery, Vera Rönkös, László Sáry, András Soós, Máté Szigeti, and Péter Tornyai. In one section (Photo and Sound) there is not one single piece, rather only ideas, instructions for use, and suggestions for transforming the manifestations of everyday life—from the sound of a concrete mixer to the chirping of a bird—into a composition. One of the important characteristics of making music from the small details of reality is Bali’s way of looking at things, as shown by the enlarged photograph details, which cause you to reflect, in the first section entitled Drawing and Sound. This follows in the footsteps of such eminent predecessors as John Cage and Zoltán Jeney. Besides photographs taken by Olga Kocsi, Hanna Tillmann’s graphics—sometimes witty, occasionally thought-provoking or constituting an organic part of the composition—also form an important part of the volume’s instructions. Before the Instructions attached to the first volumes of Games, Kurtág expresses a few words concerning what he would like to encourage: “Pleasure in playing, the joy of movement—daring and if need be fast movement over the entire keyboard right from the first lessons, instead of clumsy groping for keys and the counting of rhythms …. On no account should the written images be taken seriously, but the written images must be taken extremely seriously as regards the musical process, the quality of sound and silence.” Overcoming the music student’s inhibitions and encouraging his/her creativity are the most important aims of János Bali’s Introduction. The collection provides varied opportunities for that, from hint- like instructions for ‘piece generation’ or graphic scores to the most traditionally recorded, set compositions. The ensembles performing the pieces can also be varied, from a solo recorder and very different accessories (a jug of water or mobile phone) all the way to a recorder sextet. 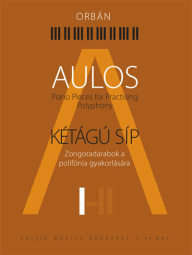 At the same time, similarly to Kurtág, the collection develops the technical skill of playing the instrument and also teaches a responsible attitude to the performed sounds. Although in some compositions greater emphasis is laid on enthusiastic creativity than a secure mastery of the instrument, other pieces require a high-level skill in playing the recorder. Thus a good teacher can use the publication when teaching music students who have the most diverse grounding. Furthermore, we can say that for lower-grade recorder teaching, Bali is primarily addressing music teachers, introducing them to the avant-garde, giving them advice for the journey, inspiration, ideas, an open attitude towards everything new, exciting, and challenging, which gives support and help right at the start of the journey. The versatile and prolific composer György Orbán is known internationally primarily for his choral works. His music is always witty - a feature of Haydn - and at the same time it often profoundly touches his listeners with a cathartic power. For more than a quarter of a century he taught composition at the Budapest Academy of Music, for a decade as a departmental head. With all certainty, rigour characterises him. György Orbán’s compositions thoroughly put performers to the test, be they an amateur choir, an instrumental soloist, or a solo singer. However, those who know him personally know that he has an exceptionally open personality and is blessed with a wonderful sense of humour, someone who temperamentally cannot compose or teach in any other way than in the most personal manner on the basis of the most personal experiences and associations. The structure of this collection is more confined than the other two; it deals with specific musical phenomena, and in its main part constructions for the alternate preludes and fugues of Bach’s The Well-Tempered Clavier can be felt. Confined, yet in every respect irregular. The alternate pairs of pieces become greatly imbalanced and are replaced by three-piece sub-cycles; the number of pieces is arbitrary; the alignment of lightly-touched tonality is incomplete; and in terms of the basic characteristics of polyphony, the canon is missing; namely the composer “doesn’t like it.” Perhaps with this point we can quite understand why the entire series is primarily about games, a love child, the creation of which was a pleasure for the composer, such that both the composer and the pianist could feel absolutely liberated and exempt from school rules. This motif of playfulness permeates everything and is present in the most serious moments of the pieces--preludes, fugues and fughettas, capriccios, fantasias, studies, choral works, psalms and hymns—as well as in the written commentaries. Among the three works, Orbán’s work most recalls a type of textbook, since it demonstrates concepts such as double counterpoint, mirror conversion, the double and triple fugue, cantus firmus, and complementary rhythm. However, by means of the facilitating and uniquely sounding commentaries about the demanding pieces, students mainly feel that someone is speaking personally and is explaining precisely why polyphony can become an issue of personal feeling for people. Behind the three educational undertakings there stand several decades of teaching experience and three decidedly different personalities. At the same time, all three enterprises are uniquely clear and based on shared convictions. That is to say: music making is an intellectual discovery and adventure, and is an extremely important and serious matter that bears upon our entire lives, choices, and actions, and from which we can gain experiences and encouragement which cannot be compared to anything else. However, all this demands of us serious-mindedness, concentration, and responsibility.